Will dispense in machines with a 1" vending wheel. 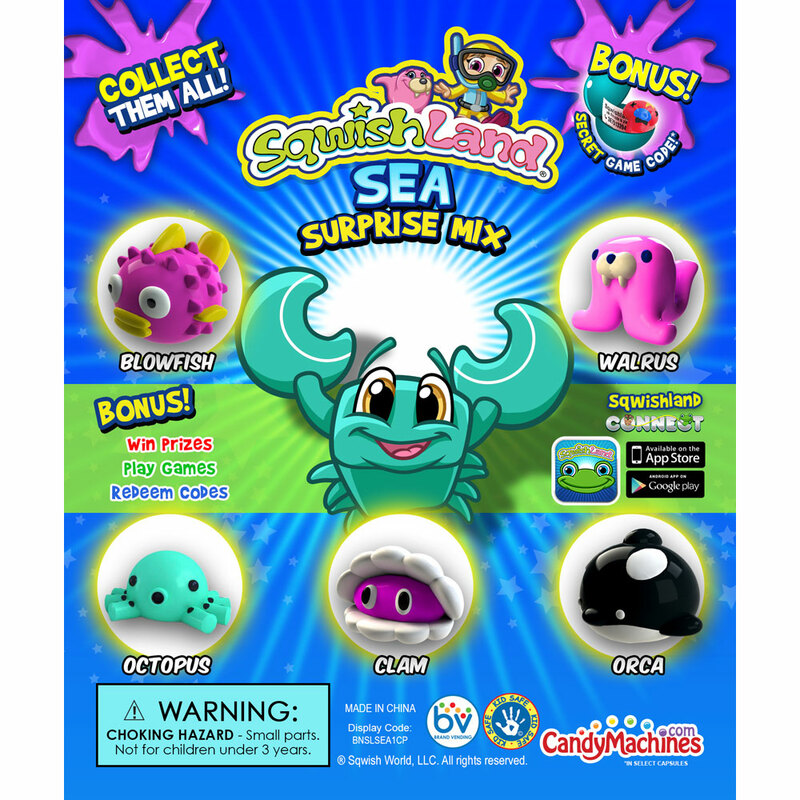 Original and first in the series of collectible Sea Mania squishy soft rubber pencil toppers. Case includes approximately 245 Sea Manias per case. Catch them all, the Clown Fish, Dolphin, Sea Horse, Orca and Octopus. 10 different characters in all. Every capsule includes a code to play the new online Sqwishland game. 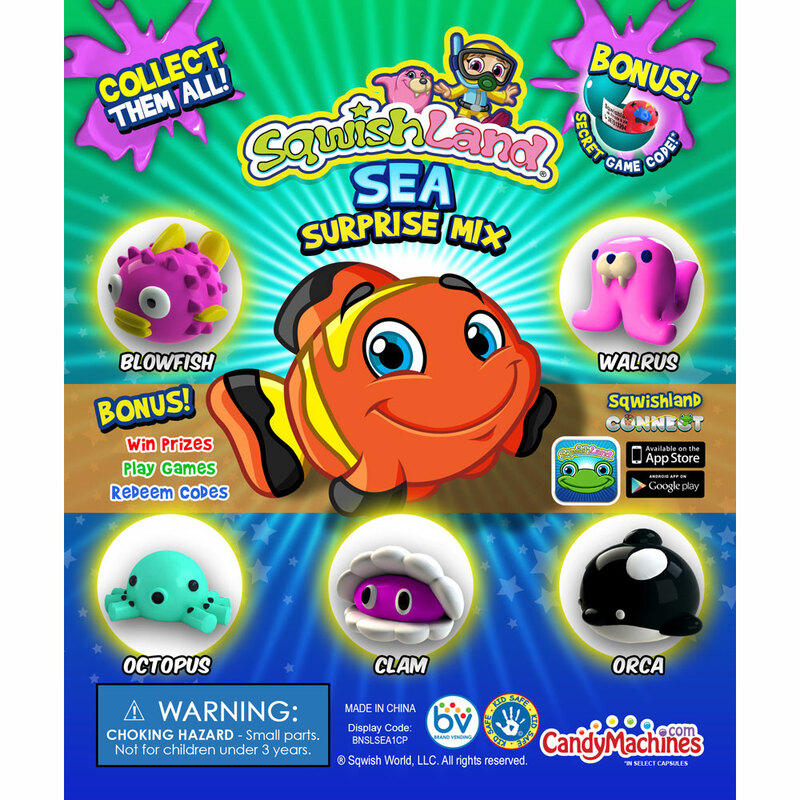 Each sea animal pencil topper comes in a round easy open capsule with a safety seal. Every bag offers a fun mix of 250 toy capsules which are pre-filled for your convenience making it quick and easy to load into your bulk vending machine. These toy filled capsules are ready to vend and will dispense in machines with a 1 inch capsule or gumball vending wheel. i personally love these squishies. my favorite is the octopus. in 2008 me and my friends were so into them but now i'm the only 1 who likes them.but i do think that candymachine.com should sell a pack of all the manias together. Isn't the one-eyed crab Sea-Mania Squishee super-rare, because I have one :D. Tell me if it is :P.
i love squishes and sea mania you can trade and you get very excited for a rare some people dont notice the diffrence in rare and give someone a non rare for a rare i like the glowys i have 134 of them isent that alot i love these there so awesome. i like sgusies i collect them me and my friends put them down the slids @ reses!thats why im buying the sea mania ones cause there SO CUTE !!!!!! !